Learn how Cocofloss, a luxury dental floss company, executed a full-funnel marketing campaign utilizing paid social and strategic on-site messaging to achieve some astounding numbers in a short time. What other technologies are on the Cocofloss Dream Team? 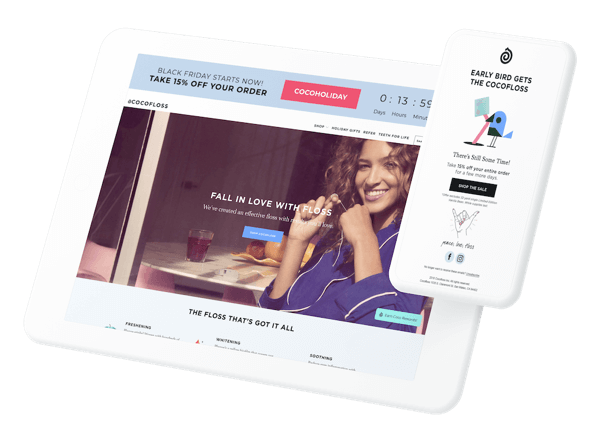 They use Klaviyo for email, Justuno for lead capture and personalized on-site messaging, and Shopify as their e-commerce platform. Cocofloss, a company putting a fresh spin on flossing, uses MuteSix as their marketing agency to help them grow their company and make flossing fun for all. Download the case study to learn more about how the two worked together to grow Cocofloss’s email base and turned their social ads into marketing magic. BONUS: Don’t have time to read the case study? Watch the short video above to get the highlights. Justuno helps drive down CPA’s and produce healthy ROAS. This combined with our email marketing efforts and strategy enables us to deliver a solid full-funnel approach for our clients. By deploying Justuno to quickly grow targeted lists and also retargeting those leads with a strong nurture strategy, MuteSix has been able to squeeze even more value out of their clients’ budgets. With help from the Justuno Professional Services team, Shady Rays increased their email list by over 200,000 leads in just six months. Learn how Shady Rays increased engaged conversions while decreasing bounce rate.